OpenVSwitch is, as you can figure it out from the name, a virtual switch based on open standards – and there is an open source version also -. OpenVSwitch (OVS) helps to define independent networks resources inside every tenant in your cloud and manage the same standards as any physical switch (i.e. VLANs), also you can duplicate MACs and private IP subnets among different tenants without any issue at all. 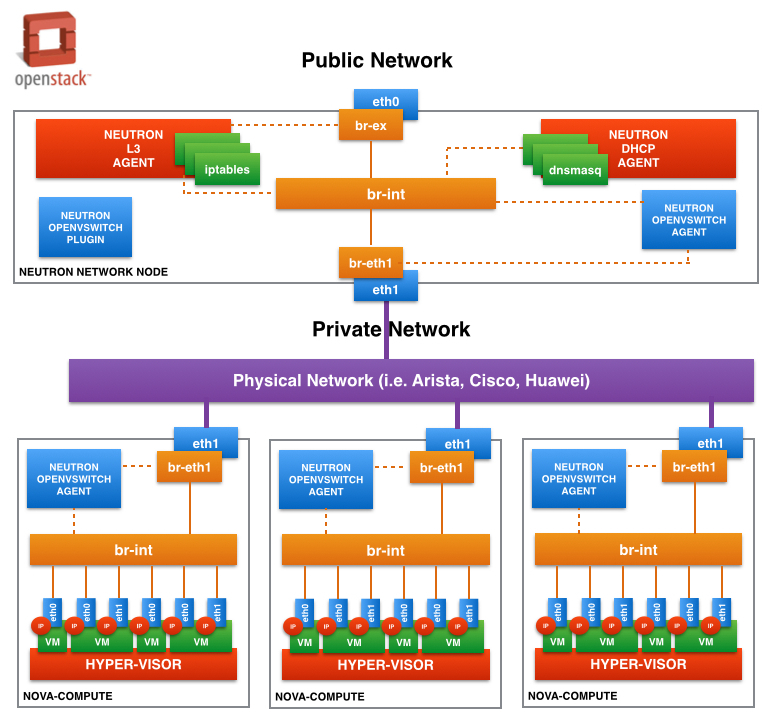 I don’t need to justify why to use Neutron instead the classic Nova-Network solution into the OpenStack ecosystem… Just do it! You will get L3 devices (virtual routers) that can be configured by any user and advanced features at every OpenVSwitch like IP-Tunneling. Neutron also helps you to avoid bridged your network configuration to the physical VLAN or Node’s Network Interface through OVS. Hungry for more info, you can read a interesting post from Radoslaw Tomaszewski. OSV is using OSV-Agents at every Compute Server in order to bring this Networks Virtual capabilities at every User Tenant and get Setup information from the OSV-Plugin installed at Neutron Server. Also, OSV-PlugIn communicates the user-defined security and routing rules to Neutron Server (i.e. iptables) at every virtual router configured into the tenants. If you want more and something out-of-the-box to support your SDN solution with VMWare or/and OpenStack, there is a high chance you need to dig into your pocket. One of the most exciting solutions comes from Nicira – now, a VMWare’s company – Nicira is the most important contributor to OpenVSwitch’s project and has developed enhanced capabilities on NSX in comparison to the normal OVS’s features. In Summary, these capabilities helps you to manage, control and scale-out all the OSV operations (user-defined security and routing rules, flow and network tenants’ settings, tunnels, etc. ) in a consolidated and simple way through an external NSX Controller Cluster. This NSX controller works fully integrated to OpenStack Neutron replacing the OVS-Plugin and components like iptables. Previous Previous post: What do I have to choose to efficiently store, protect and manage my private cloud’s data?